This is my sister-in-law’s favourite soup and one she has made for me quite often as a vegetarian meal when I’m visiting her. 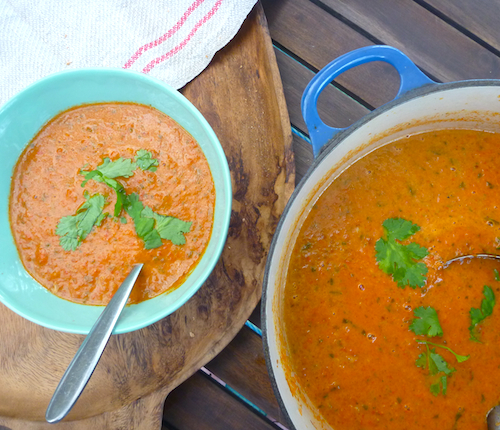 It really is the most spectacular soup with a rich, complex flavour. A couple of weeks ago when I was visiting brother’s family in Wagga, I made this soup for my sister-in-law’s birthday dinner and, for the first time, I used chipotle chilli rather than just substituting it with hot smoked paprika. 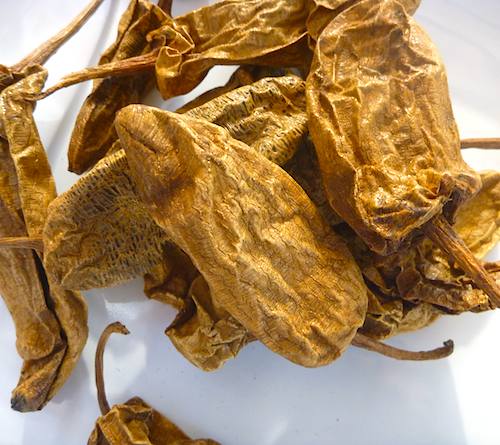 These distinctive sepia coloured chillies look rather unappetising and even a bit creepy. In fact, I had to Google them while I was making the soup because I was worried I was just throwing a really, really old chilli into my special birthday dinner soup. 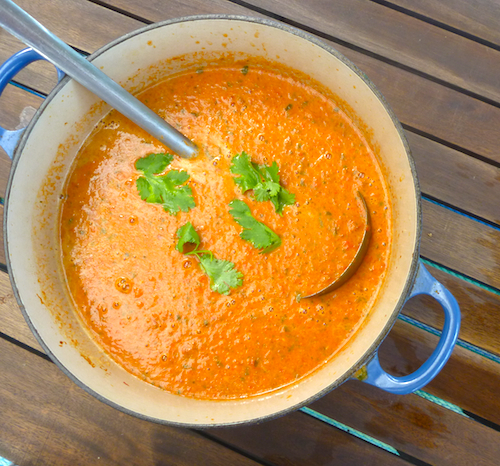 The chipotle chilli was a bit of a revelation to say the least – it has a rich smoky chilli taste without the heat that gives this soup a flavour dimension that is quite unlike anything else. Despite my reluctance to take on any new and exotic ingredients (my store cupboards really can’t bear it) I had to track down some chipotle chilli when I got back to Sydney. In the end, I ordered some online from Fireworks Foods, which seem to have the best and most reasonably priced range of specialist Mexican food that I could find online. While I was ordering my chipotle chillies, I also ordered some ancho and habanero chillies, so I guess I’ve somewhat tentatively jumped on the Mexican food bandwagon that seems to be sweeping through Sydney at the moment. 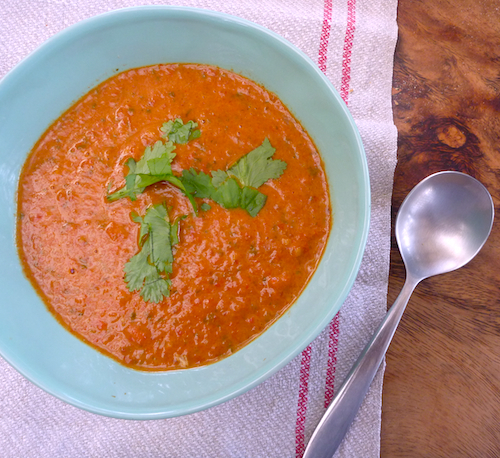 If you don’t have any chipotle chilli, don’t be put off making this soup because it’s still perfectly delicious with a substitute of smoked hot paprika or just plain chillies. The recipe originally comes from Cooking with Kurma by Kurma Das. Kurma is a Hare Krishna vegetarian cook and replaces all onions and garlic with asafoetida in his recipes. As I don’t have anything against onions and garlic (in fact, I find it difficult to cook without them) I’ve put them back in for this recipe. The addition of peanut butter makes this a fantastically creamy, vegan soup, its richness offset by copious amounts of coriander. For the coriander-phobes out there, I don’t really know what you could replace it with because it does really make this soup sing. 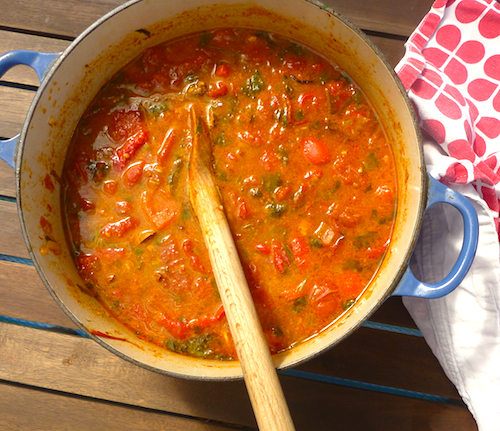 Make this soup now while there’s still some decent late season season tomatoes available. Better yet, make a double batch and you can freeze some for the cold winter nights ahead. 1 large bunch of coriander leaves, stalks and roots chopped. Preheat oven to 200°C. 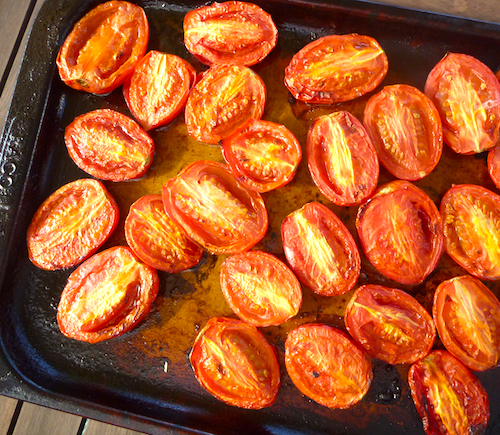 Cut tomatoes and place cut side up on a baking tray. Arrange red peppers on an extra tray. Drizzle lightly with olive oil and bake until edges of tomatoes and peppers are caramelised and blackened (about half and hour to forty minutes). The peppers will need to be turned at least once. 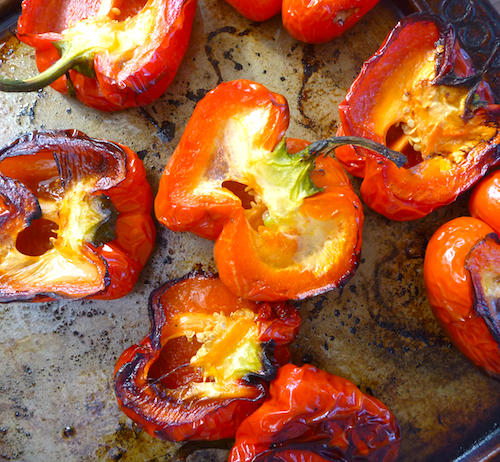 Place peppers in a sealed container and let the skins steam until they are cool enough to handle and peel. Roughly chop tomatoes. Heat oil in large saucepan fry onion, garlic and chipotle pepper/fresh chilli and coriander stalks and roots, until onion is translucent. Add roughly chopped tomatoes, peppers, coriander leaves and smoked paprika if using. Saute for a five to ten minutes until the tomatoes have completely broken down. Add stock, salt and pepper, bring to the boil and then reduce to a simmer. Cover with lid and simmer for 25 minutes. Remove soup from heat and mix in peanut butter. Process soup until smooth with an immersion blender or in a food processor. Return soup to a clean saucepan and reheat gently. The soup should be thick and creamy but if it is too thick add more water or stock. Taste for seasoning and add extra peanut butter if desired. Fantastic soup, made it last night for friends and we all loved it, must say it was also great to be able to ring Elizabeth and just check that I was on the right track, I am her big sister after all. Really loved this soup, made it for friends two nights in a row and then had the leftover for lunch, all the dinner guests loved it. I know, people love it. It’s very unusual complex flavour that it is quite unlike anything else. It’s just so good. This is going to be so fabulous, I can’t wait to have it in a bowl on these grey days we’re having here! This soup is actually from my archives but it is the most spectacular soup and deserves to be better known. Oh wow, that sounds incredible. I definitely need to make this and start stocking my freezer with soups for the cold weather that I know isn’t far off now! It really is the most fabulous soup. Good to stock up on for the wilds of winter for a Sunday night supper. I used to make this years ago. I love it. I make it with peanut butter spring rolls. They’re perfect for dipping into it. You’re mum’s a very good cook! I have Kurma’s cookbook that contains this recipe. It has been a favorite for years, and everyone I’ve served it too has loved it. I stick with the asafoetida instead of alliums because I love the unusual flavor. Yes it’s a classic recipe. Kurma’s cookbooks are under-rated he has an incredible of knowledge of Indian food.